On 18 April 1943, near the town of Stourbridge, four young boys in search of bird nests in Hagley Wood found a hollow elm tree (a Wych Elm or Scots Elm). One boy climbed up and peered into the hollow trunk and found a human skull staring back at him. Despite a pact of silence, one boy, Tommy Willetts, told his father about their grisly discovery and the police were quickly called. The Worcestershire County Police recovered a skeleton from the trunk, along with some fragments of clothing and finger bones scattered around the trunk. A pathologist concluded that the remains belonged to a woman who had been placed in the tree about 18 months previously (October 1941) while still warm. 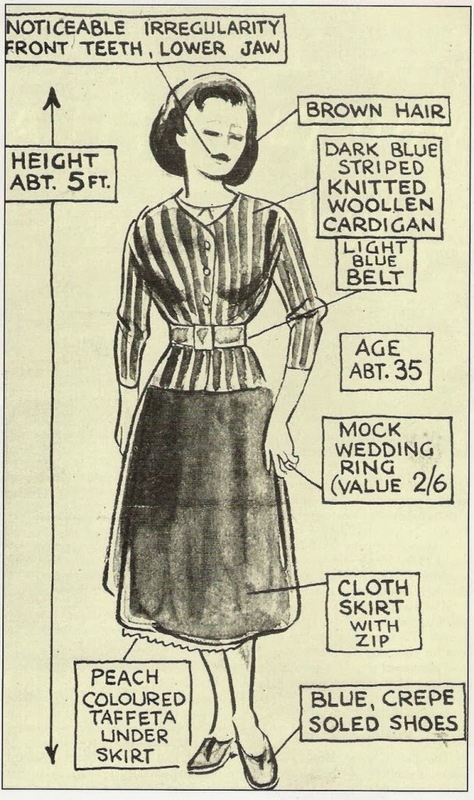 She had likely been asphyxiated due to the taffeta stuffed inside her mouth. 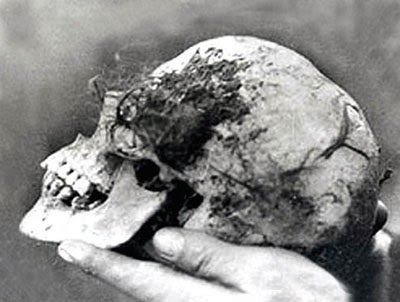 The skull found in the Wych Elm. (From Brian Haughton's website). The woman was thought to be 35-40 years old. She was five feet tall with mousy brown hair and a deformed lower jaw. She wore a cheap gold wedding ring, no more than four years old, and had given birth at least once. Police sketch of "Bella" found in the Wych Elm. The woman's distinctive teeth were a promising lead for identification purposes, but despite contacting every dentist in the country, police were unable to identify the mystery woman. 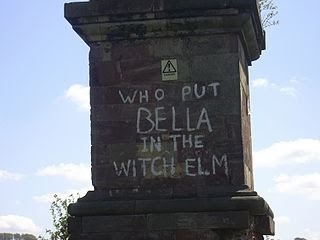 Six months later, graffiti asking "Who put Bella down the wych elm" appeared in the region. Did someone know something? If so, no one was talking. The woman had seemingly come from nowhere and was missed by no one. Some speculated that the woman had been the victim of an occult ceremony. Others thought that she might be a Roma (gypsy) who had afoul of her community and been put to death. Graffiti asking "Who put Bella in the Witch Elm"
In 1953, a woman calling herself "Anna" contacted a newspaper claiming to have information on Bella's killers. Anna met with local police and claimed that Bella had been murdered by a German spy ring which involved a British officer, a Dutchman and a music hall artist (or a trapeze artist, depending on sources). Anna claimed that Bella was a Dutch woman who arrived illegally in England, got mixed up in the spy ring and paid the price with her life. In 1968, writer Donald McCormick wrote a book (Murder by Witchcraft) in which he claimed that Bella had been a Nazi spy named Clarabella, recruited by the Abwehr and given the code-name CLARA. McCormick claimed to have seen Abwehr records which suggested that CLARA had parachuted into the West Midlands in 1941 but had failed to make radio contact. McCormick suggested that the woman was actually Clarabella Dronkers, a Dutch woman who had lived in Birmingham. She had irregular teeth and would have been 30 years old in 1941. Interestingly, a Dutchman named Johannes Marinus Dronkers was executed as a spy by the British in December 1942. In March 2013, The Independent newspaper put a fascinating spin on the case of Bella in the Wych Elm. They suggested that perhaps Bella was none other than Clara Bauerle, the mistress of German spy Josef Jakobs. The Independent presumed that Clara Bauerle and Klara Sophie Bauerle (found in the Home Office records) were the same person. The newspaper indicated that Bauerle was a cabaret artist who had spent two years working in the music halls of the West Midlands before the war and that she spoke English with a Birmingham accent. It was suggested that English audiences could easily hear "Clara Bauerle" as "Clarabella". The music hall connection also harkened back to Anna's information in 1953. The newspaper claimed that Jakobs had said Clara was due to parachute into the Midlands in the spring of 1941. Jakobs did say that Clara might follow him to England but, to the best of my knowledge, gave no specific location for her arrival. The Independent noted that there were no gramophone recordings, live performances or movie appearances in her name after 1941, a tantalizing mystery that would apparently leave Clara Bauerle as a potential candidate for Bella in the Wych Elm. D.J. Cockburn has written a nice summary of the various theories around Bella in the Wych Elm - well worth a read. Thanks for the comment! The photograph is, of course, an unknown quantity and other photos of Clara seem to be few and far between. It could be Clara or perhaps not. It would be interesting to find out the height of the other women in the photograph as well as the man at the far left the grouping (presumably Bernhard Ette). Without a solid benchmark, I tend to give more weight to Karel Richter's observation that Clara was a tall woman. No worries! I love a good mystery as well. Good to know that Ette was a short guy! I went back to the site where I found the photograph (a German grammophone forum) and the identification of the women in the picture is speculative. The forum aficionados thought it "could" be those three women given the date of the photograph, who was singing with Ette at the time, etc. They thought that because Lohse was blonde, she would be the one on the right. Other forum participants disagreed suggesting a few other singers. So, unfortunately, the photograph is not a sure thing. Naturally Richter and Jakobs were fighting for their lives and everything they said needs to be taken with a grain of salt. It doesn't help that beauty is in the eye of the beholder! Jakobs himself was a hair under 6 feet. Also - not sure if you read the other two posts (late Jan & early Feb) I did on Clara but... according to a Bavarian Music Archive website, she died in Berlin on December 16, 1942. If we're talking conspiracy theories - I did notice a passing resemblance between Vera Erikson (spy landed November 1940 in Banffshire) and the sketch of Bella in the Wych Elm. Hello Giselle. 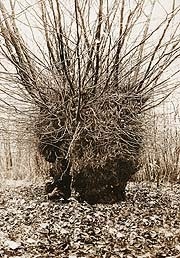 I ran across your blog while I was searching for information on Bella and the wych elm, and I really appreciate the research you've done. You seem to have pretty thoroughly debunked the theory that Bella was Clara Bauerle. I have a couple of questions. Do you mind if I ask where the photos of the wych elm and 'Bella's' skull came from, and do you mind if I use them on my own blog post on the subject? I haven't done anywhere near as much research as you, so I'll be linking to your blog. The photos come from Brian Haughton's website listed in the References. They seem quite widely distributed on the internet. I usually try to put a link back to the site in the photo caption (noticed I didn't do that on those postings!). Thanks for the link back. I'd appreciate a link to your blog once you've done the article. And yes, since you asked, you can use the photo of Josef (just link back to my blog). Thanks, Giselle. The post should go up in a couple of weeks. I'll put something in this box when it does. The post went up today, at https://cockburndj.wordpress.com/2014/12/03/inspirations-who-put-bella-in-the-wych-elm/. Thanks again for your help on a few points, and I'd be grateful for any further thoughts you may have. Thanks DJ! I'll check it out.